Heckingham is a small parish in the south Norfolk district. The earliest known document recording the village is the Domesday Book written in 1086 that identifies the presence of a church and a mill in the parish. It also records the fact that some of the area was marsh. The village name derives from Old English and could be translated as ‘homestead of the people of Heca’. This derivation and the recording of the village in the Domesday Book suggest that the settlement was founded in the Saxon period. This suggestion can be corroborated by archaeological evidence. An intensive fieldwalking survey has been carried out in conjunction with other surveys in the adjoining parishes of Hales and Loddon. This found evidence for activity in the area from the Mesolithic period to post medieval times and identified areas of settlement dating to the Iron Age, Roman, Saxon and medieval periods. The earliest archaeological finds are a Mesolithic micro blade and micro core (NHER 10510) found during the fieldwalking survey. The presence of these finds near Heckingham Beck suggests this may have been the location of activity during this period. 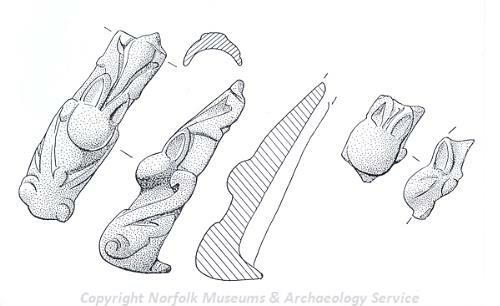 A Neolithic flint axehead (NHER 10508) has also been recovered. Fieldwalkers found Neolithic to Bronze Age worked flints (NHER 22676, 22692 and 22695) in many of the fields in the parish. These finds seem to be concentrated on higher ground. Exciting finds include the blade of a Neolithic flint knife (NHER 22676). Pieces of a Bronze Age collared urn (NHER 22655) are the earliest dated pottery found. Fragments of Iron Age pottery (NHER 22670 and 22684) have also been recovered. The concentration of Iron Age pottery pieces at one site is so dense that it suggests this may have been an area of Iron Age occupation (NHER 22670). This is also located close to Heckingham Beck. It was also in this area that evidence for Roman settlement (NHER 10510, 20581, 22662, 22670 and 22684) was found. During this period it has been suggested that settlements began to grow and additional centres of occupation were established. Where we can date the finds from these settlements they seem to suggest people were living here in the 2nd and 3rd centuries AD. Although most of the Roman finds are fragments of pottery, several Roman coins (NHER 10522, 20581 and 20754) have also been recorded. At one site two Roman copper alloy coins (NHER 22673) were found stuck together. This usually suggests they were part of a hoard or may have been a purse when they were deposited in the ground. In the Early Saxon period it appears that settlement dwindled. Only two possible settlement sites (NHER 22670 and 22684) have been identified. One of the key problems with identifying Early Saxon sites is the similarity of handmade Early Saxon pottery to handmade Iron Age pottery. It is thought that at least one of the sites (NHER 22670) is more likely to be an Iron Age settlement rather than a Saxon one. An Early Saxon buckle (NHER 22663) has been found by a metal detectorist in another location in the parish. There is more evidence for Middle Saxon settlement (NHER 22679, 22680 and 22681). This seems to have moved away from earlier foci and was concentrated in the valley of the River Chet and around St Gregory’s Church (NHER 10511). Interestingly the pottery recovered from these sites includes fragments of black burnished ware and locally made sandy pottery (NHER 22681). Metal detecting has recovered further evidence of Middle Saxon activity – two Middle Saxon pins (NHER 22682) and a Middle Saxon brooch (NHER 22663). Late Saxon settlement (NHER 22663, 22664 and 22681) is widespread. This is in contrast to the patterns seen in the adjoining parishes of Hales and Loddon. In Heckingham settlement remained close to the church and earlier Middle Saxon settlement sites. Finds dating to this period include a Scandinavian type weight (NHER 20581), two stirrup mounts depicting strange rabbit-like faces (NHER 22666), a coin (NHER 22666) and silver ingot (NHER 22666). The dating of the ingot is not completely clear. Medieval settlement (NHER 10510, 20724, 22663, 22664, 22665, 22666, 22670, 22679, 22681, 22682 and 22693) seems to be in different locations from earlier occupation. The floor of the River Chet remains an important focus. A second focus west of the valley around Hill Farm has also been identified. Medieval pottery was found in every field in the parish that was surveyed. These pieces of pot were spread around the parish during manuring. It suggests that medieval exploitation of the landscape was intense. Heckingham Hall (NHER 17496) is a medieval moated site recorded in documents. The land around the hall is pasture and so could not be fieldwalked, but the lumps and bumps visible in the fields are likely to be the remains of more medieval settlement. There are also the remains of a medieval moat at Little Church Farm (NHER 23459). In old documents this site is recorded as 'Bugmongers Tenement' after Adam le Bucmonger who owned it. 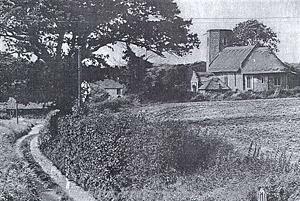 Documents also record the presence of medieval fishponds and buildings in Oldhall Carr (NHER 23460). St Gregory’s Church (NHER 10511) is a Norman church with a thatched roof. The south doorway is an excellent example of Norman architecture. It may have been carved by the same architect as the more famous doorways at nearby St Margaret’s Church (NHER 10523) in Hales. Medieval finds from the parish include coins (NHER 22668) and a horse harness pendant (NHER 22679). During the post medieval period settlement again decreased in intensity. Many of the former settlement sites were abandoned including that around Heckingham Hall, sites on the valley floor and sites adjacent to the church. The focus at Hill Farm appears to have gradually become smaller until only the farm remained. Other changes were also taking place. The church (NHER 10511) was altered. The octagonal tower was strengthened in the 17th century reusing some building material from elsewhere. The present building at Heckingham Hall (NHER 17496) was also constructed in the 17th century. Documents record that there was a windmill (NHER 22687) in the parish before 1653 and place names around the site still refer to the mill. Heckingham Workhouse (NHER 10539) was built slightly later between 1764 and 1767. A pest house was added some distance from the main buildings. This is said to be the earliest Union workhouse built in Norfolk. Later it became Hales Hospital. Megan Dennis (NLA), 2 February 2006.
http://users.ox.ac.uk/~peter/workhouse/Loddon/Loddon.shtml. Accessed 30 January 2006.
http://www.roll-of-honour.com/Norfolk/Hales.html. Accessed 30 January 2006.
http://www.norfolkchurches.co.uk/heckingham/heckingham.htm. Accessed 2 February 2006.